I think that theatre has stopped shaking people. There’s nothing wrong with people being entertained, that’s part of it, but there’s other elements and other things that theatre can achieve. In a way it doesn’t matter that this play is set in Zimbabwe, the questions posed by Whaley are universal. 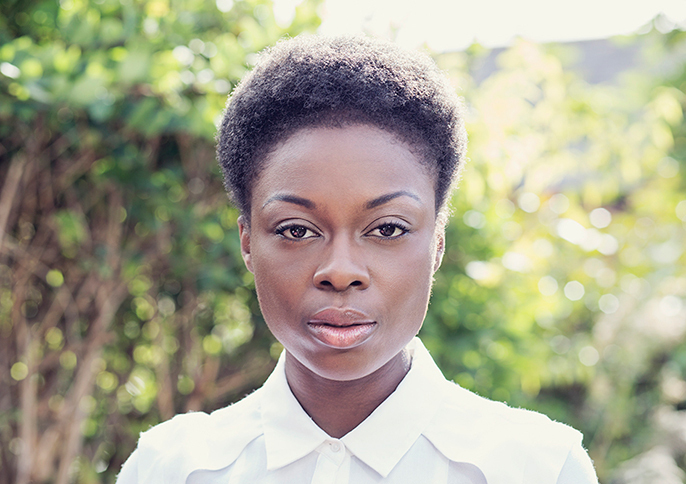 Joan Iyiola first realised her dream of being an actor during her initial term at Cambridge. It came as a surprise as she was studying law at the time. In an unanticipated turn of events, Iyiola went on to complete an FdA at Bristol Old Vic and has been busy ever since. 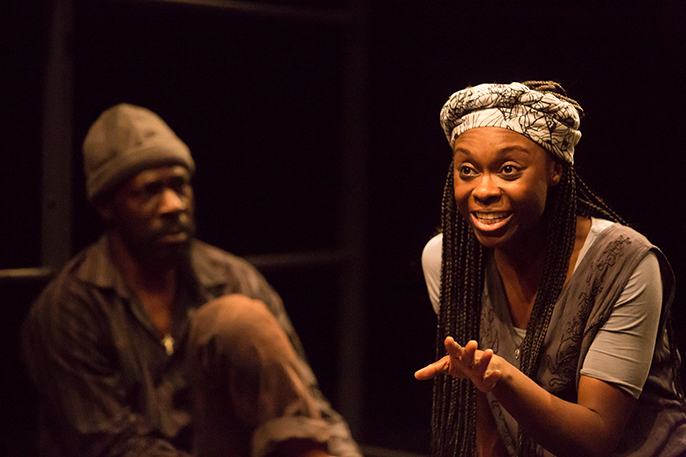 The Londoner has performed with the RSC, the Bush Theatre and received fantastic reviews for her role in A Season in the Congo at the Young Vic. Somehow Iyiola has also found time to co-found The Monobox; a project which assists aspiring actors to develop their monologue skills. Currently playing Febi in Andrew Whaley’s The Rise and Shine of Comrade Fiasco, I am struck by the depth of research Iyiola has done for the role. The former member of the NYT insightfully depicts post-colonial Zimbabwe and the position of women as her lunch gets progressively colder. It is easy to see that Iyiola has a natural affinity for the stage. She is incredibly charismatic as we discuss the play and the broad significance it has 25 years after its first performance. How would you describe your character, Febi? During the civil war she was what they called a chimbwido. They were young women who would go up to guerrillas in the mountains and give them the food and materials they needed. They were recruited by the guerrilla fighters and were an essential part of the struggle. It was quite dangerous because if they were caught by the opposition they’d be brought in for questioning or worse. It’s interesting because from the research we’ve done, during the war there was equality between men and women were because they needed each other. When the war finished it went back to this male dominated, hierarchical society. Febi represents a woman who’s come out of the war and is saying ‘I’ve earned my independence.’ She starts her own hair and fashion business and she goes to Bulawayo a lot which is the cosmopolitan part of Zimbabwe. She doesn’t need a man and she stands up to men. Febi represents a number of women in Zimbabwe and ultimately how women have sought independence after Zimbabwe got independence. Those are two very different things. This is a four strong cast. What is the dynamic between the four? The play opens on Febi, Chidhina and Jungle having been thrown into a prison cell because of a brawl the night before. In the cell we meet this enigmatic character, Comrade Fiasco and he doesn’t know the war has ended. In terms of the brawl, the details are never really revealed. Chidhina and Febi have a history; they were in the war together and have an understanding. Jungle is a slightly older generation, a representative of the black experience under colonial Rhodesia. There were points in the play where Febi flips between Chidhina’s side and Jungle’s side when they’re trying to work out who Comrade Fiasco is. I think the reason is that Febi just wants to go with the person who will move the investigation along. For any parent they want their children to be able to support themselves and be OK on their own. Then I turned around and said I want to do the most unreliable job out there. Both Jungle and Chidhina get stuck in their investigations in different ways. Jungle has a spiritual side and he believes the story that Fiasco is telling. For Chidhina it represents a war. Chidhina is suffering from post-traumatic stress disorder, in a way it can be argued that Fiasco is as well. So her relationship with Chidhina is a deep understanding. She also begins to understand Fiasco. Jungle she does try with but Jungle represents a traditional male who can be quite chauvinistic which she has no tolerance for (Laughs.) It’s fabulous to play a character like that. Would you say that the position of women in Zimbabwe is still one of oppression? It’s a tradition. Women weren’t encouraged to be educated. There were so many strong women who were fighting for the cause of women, but when they came out of the war they realised that women didn’t have a place in society apart from as mother. Rearing children, cooking, cleaning and so on. Women couldn’t be equal until they changed the laws on education in Zimbabwe. This play was written 25 years ago and yet we’re having the same discussion. Andrew Whaley wrote this play in 1990. It went to the Edinburgh Festival where it won a Fringe First award and it’s never been put on since! So it feels like a new play and is relatable. The issues that we’re talking about such as remembering our history and having a voice and moving forward are all so relevant. Something that was said in rehearsals that really rang true is that our generation is encouraged to have amnesia. Britain is incredibly interested in Zimbabwe, and we often forget what has led to the current situation. Also the history that comes out from people who have lived it is a different history to what we’ve been taught; the lives of ordinary people and their part in the struggle is completely overlooked. Has the writer, Andrew Whaley been involved in putting on this production? We have had a lot of email exchanges with him and he’s fantastic. Very funny, very humorous, a real poet and he’s so pleased that were putting on this play again. We’ve asked him a number of questions because in reading the play you discover that quite a bit of the action comes out of improvisation as well as his writing. For example in the script it will say “Now Febi sings the theme song for Comrade Fiasco.” And you go ‘Wait, where that is? I haven’t come across it.’ So you get the sense that these were players that were working with his script and developing it when they first put it on. So there were some questions that we had to ask so we could appreciate the relevance of the issues today and comments he’s making about Fiasco. There’s been many insights that make us understand the world he was writing about at that time, and that allows us to interpret how we want that to present the play when we perform it today. The play is being directed by JP Morgan Emerging Director award winner, Elayce Ismail. Is this her first completely solo project? Elayce chose to put on this play and it’s completely her project. She an incredible woman who I first met at the National Youth Theatre; she was one of the idolised generation above me. She was there an actor and I would call her a performer actually. She’s a lady with a multitude of talents. I’ve actually worked with her before as she was the Assistant Director for A Season in the Congo which she won an award for and soon after became the Resident Director at the National Theatre Studio. She’s an incredibly sensitive and energetic director so it’s been fabulous to work with her. Why did she choose to put on this particular play? I think it’s a production that speaks for itself. With Andrew Whaley’s writing you hear what he’s saying and it just hits you. I think that theatre has stopped shaking people. There’s nothing wrong with people being entertained, that’s part of it, but there’s other elements and other things that theatre can achieve. 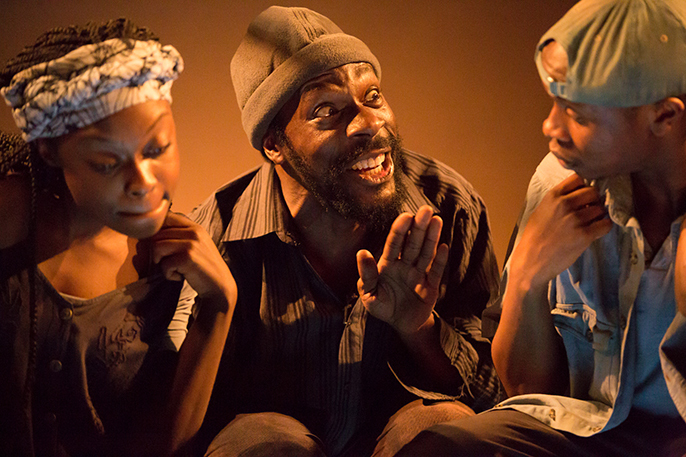 In a way it doesn’t matter that this play is set in Zimbabwe, the questions posed by Whaley are universal. Obviously this is a play set in Zimbabwe. Are you particularly drawn to African plays? Only a couple of plays that I’ve done have been set in African countries. But I would say, yes absolutely. In the same way that I’m drawn to classical plays or plays that have a political message that I believe in. What I do enjoy in doing a play based in African countries is that you get to explore Africa. You get to really get your teeth into it and get an understanding of other African countries, because Nigeria is not the only one much as it’s had such weight in my life. I think the education system should include a greater range of history. We never did anything about any African or Asian countries; we did America and the World Wars. I’m drawn to African plays in that I’m just interested in plays that give me different accounts of how people work and their country’s current situation and how we in the UK work alongside them. I have no family in the industry, but Nigerians are storytellers. You’ll sit for three hours whilst an elder tells you a story. Also I loved films growing up; all eras and I loved French cinema. So storytelling and film were big parts of my upbringing. Then I joined the National Youth Theatre at sixteen and I did that every summer for five or six years. I really fell in love with it then. But my parents were very clever, they always sold it to me as extracurricular and to build confidence. I never considered it to be something one could do as a career - my parents were very sneaky. (Laughs.) I went to Cambridge University to study law and being surrounded by people who were studying drama and other creative courses, and it wasn’t until the end of the first term that I realised I wanted to be an actor. I loved law and for me there are parallels. It’s about people and human nature. So bizarrely, law became the hobby and acting became the thing that I wanted to do as a career. So after Cambridge I went to Bristol Old Vic to do an FdA in professional acting. My dad almost wept (Laughs.) But now they are incredibly supportive. For any parent they want their children to be able to support themselves and be OK on their own. Then I turned around and said I want to do the most unreliable job out there. You’re Co-Director of The Monobox. What does that project involve? The Monobox was set up by Polly Bennett and myself just over two years ago. We met at the National Youth Theatre and fell in love (Laughs) but then we went our separate ways for university but stayed in touch. I was at the Bristol Old Vic doing my FdA and you have to do a lot of monologues as part of your course. I was the only black girl in my year and I didn’t find anyone to bounce things off of so we’d go over things together. What we realised was that as an actor you’ve got to think about your casting, what plays and genres you’re interested in, what you’re right for. There’s not something you’re schooled in as part of dramatic studies and we wondered ‘Why is that?’ As an actor once you graduate you’re sort of left to discover things for yourself and that’s not the most helpful avenue for most people. If you want to laugh. If you want to remember your history and if you want to hold onto your identity, then those are excellent reasons to come and see The Rise and Shine of Comrade Fiasco. So we decided to write to people we’d worked with and we asked them “If you could recommend a play for a talented young actor what would it be?” And they had to recommend and donate a play that meant something to them. Suddenly it was like Christmas; all of these plays started arriving through the letterbox. In the inside cover there’s a message to the reader giving the reasons for choosing that play and a nod to a monologue or scene that the reader can consider. The Old Vic Theatre and The Actors Centre have been incredibly kind and have given us free space to put on our meetings. We’re now at over one thousand, two hundred plays and we put on speech surgeries which help people find speeches and we bring in contemporaries from the industry to do Q&As and run workshops. We get actors just starting out, or people who’ve been acting for a few years and want some new inspirations. Then we get people who have embarked on other careers and have come to acting later on. I absolutely love it. It’s brilliant to be able to share a resource and it’s a spreading network. Why should people come and see The Rise and Shine of Comrade Fiasco? If you like stories and storytelling. If you want to see four actors playing a number of parts. If you like a play with no interval. If you want to be provoked. If you want to laugh. If you want to remember your history and if you want to hold onto your identity, then those are excellent reasons to come and see the show. SPECIAL OFFER: See The Rise and Shine of Comrade Fiasco and Eclipsed for £20, use code “CAVE” when booking online or by phone on 020 7229 0706 . Valid until 14th March 2015 on top price tickets only.